Submissions are only electronic via online submission system. 150-400 words. Please do not put P-value, abbreviations or any reference. Manuscripts should be submitted in MS-Word (preferably in .docx format) with the font Times New Roman (size 12 pt). The manuscript should have: Introduction, Materials and Methods, Results, Discussion, Acknowledgement (if any). Scientific names should be italic. Pages should be numbered (centered in the middle at the bottom of the page). All lines should be numbered automatically using the MS-Word. All references cited in the text should be quoted in this section. Journal names should be expanded. Please do not insert abbreviations. For example, expand J. Fish. Biol. to Journal of Fish Biology Provide Digital Object Identifier (doi) for articles wherever available. Fairson A. 2003. General Zoogeography and Turkish Zoogeography, 2nd. METEKSAN publishing, Ankara. 630 p.
Celekli A.D., Welch E.B., Yüksel S.A., Nichols S.A. 2005. Restoration and management of lakes and reservoirs. CRC Press. Florida, 591 p.
Toklu P. 1996. Micro-algae. In: P. Lavens, P. Sorgeloos (Ed.). Manual on the production and use of live food for aquaculture, FAO Fisheries Technical Paper. No. 361. Rome, FAO. pp: 7-47. Cellario C., George S. 1990. Second generation of Paracentrotus lividus reared in the laboratory: Egg quality tested. In: C.d. Ridder, P. Dubois, M.C. Lahaye, M. Jangoux (Ed.). Echinoderm research: proceedings of the second European conference on Echinoderms. Brussels, Belgium, Balkema, Rotterdam. pp: 65-70. Clarke M. 2002. The effect of salinity on distribution, reproduction and feeding of the starfish Coscinasterias muricata (Echinodermata: Asteroidea) in a rocky subtidal community of a New Zealand fiord. M.Sc. thesis, Department of Marine Science, University of Otago. 84 p.
Coad B.W. 2016. Freshwater Fishes of Iran. Available from: http://www.briancoad.com/species%20accounts/Contents%20new.htm, Retrieved 19/01/2016. Tables should be numbered and cited in the text, for example: Table 1. All tables should have a caption above the table ending to a “.”. All tables should be inserted at the end on main text. The authors can indicate the insertion place of tables in the text by putting the table's number in the bracket, for example [Table 1]. Tables must be self-explanatory, contain synthesized data, and not exceed A4 size. Data shown on graphs should not be repeated in tables and vice versa. Graphs and illustrations should be cited in the text, for example: (Fig. 1). The font of the graphs or any text on the illustrations should be Times New Roman. Size of the text on graphs and illustrations should be 10 pt. The resolution of photographs must be 300 dpi at print size (original extension: jpg or tif). Line art pictures (tif extension) must be done electronically (not scanned) and their resolution must be 600 dpi at print size. The authors can indicate the insertion place of figures in the text by putting the figures' number in the bracket, for example [Figure 1]. Colour illustrations will be published free of charge only in the electronic version of the journal (pdf files). 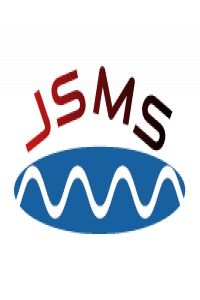 With submitting a paper to the Journal of Spectroscopy and Molecular Sciences (JSMS) you accept to transfer automatically the copyright to the JSMS. Submitting a paper to the JSMS means that all authors have seen the paper and agree with the final form of the submitted paper and their positions in the author list. No part of the submitted paper should be published before. Authors are encouraged to suggest three potential reviewers for their paper. 1. Confirm that the contents of the manuscript has been submitted solely to this journal and is not published, in press, or submitted elsewhere (or an explanation has been provided in Comments to the Editor). 2. Confirm that the submission file is in Microsoft Word document file format. 3. Confirm that the text adheres to the stylistic and bibliographic requirements outlined in the Author Guidelines. 4. Confirm that the contact details of at least three potential reviewers (Name, affiliation and email address) were prepared. 5. Confirm that all the research meets the ethical guidelines, including adherence to the legal requirements of the study country. Meanwhile, the contents of this manuscript have not been copyrighted or published previously. 6. Confirm that all authors of the paper have read and approved the final version submitted.